Underground nuclear weapon testing produces radionuclide gases that may seep to the surface, which is affected by many factors. These include fractures in the rock caused by the explosion’s shock waves that create pathways for the gas to escape plus the effect of changes in atmospheric pressure that affect the gases’ movement. Scientists have developed a new, more thorough method for detecting underground nuclear explosions (UNEs) by coupling two fundamental elements — seismic models with gas-flow models — to create a more complete picture of how an explosion’s evidence (radionuclide gases) seep to the surface. Scientists at Los Alamos National Laboratory have developed a new, more thorough method for detecting underground nuclear explosions (UNEs) by coupling two fundamental elements — seismic models with gas-flow models — to create a more complete picture of how an explosion’s evidence (radionuclide gases) seep to the surface. Their findings appear in the journal Nature’s Scientific Reports. LANL notes that underground nuclear weapon testing produces radionuclide gases that may seep to the surface, which is affected by many factors. These include fractures in the rock caused by the explosion’s shock waves that create pathways for the gas to escape plus the effect of changes in atmospheric pressure that affect the gases’ movement. Atmospheric pumping of gas through explosion-fractured rock is investigated using a new, sequentially coupled hydrodynamic rock damage/gas transport model. Previous models used a simplified approach, modeling how the gas flows but not coupling that with the explosion rock fracture models through which the gases escape: the seismology and damage. There are major differences between predictions using a realistic fracture network and prior results that did not couple models. For example, simplified fracture models produced some predictive information about the gas movement, but they did not provide the directionally dependent information — that is, whether the gas moved horizontally or upwards through the rock. Thus the new calculations are able to give a better idea of how much gas may be migrating horizontally away from the location of underground explosions using knowledge about atmospheric conditions (for example, the barometric pressure that creates a vacuum) and seasonal variabilities in different regions. This team’s research investigated the effects of the fracture network on late-time seepage (weeks to months) of radionuclide gases that migrate through explosion-enhanced fracture networks. 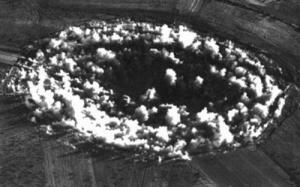 The simulations were created for one kiloton UNEs in granite and tuff at burial depths of 125, 250, and 390 meters. Rock damage was simulated in a two-dimensional axisymmetric model using the CASH (CAmpell-SHashkov) hydrocode, a computer code for modeling shock propagation. Barometric data, of great importance to the accuracy of the models and simulations, were selected from the varied climates of Colorado, Alaska, and Hawaii across different seasons and modeled with FEHM (Finite Element Heat and Mass transfer code) developed at LANL. Rather than a generic mathematical model, this research included first-principle seismology, chemistry and experimental data to improve the ensemble model. Predicting the travel time, window of opportunity for detection, and concentration of radionuclide gases from UNEs is of considerable importance to explosion monitoring. In addition to nuclear explosion monitoring, this team’s coupled model could be applied to other geophysical systems that produce fractures with subsequent flow, such as hydraulic fracturing for fossil fuels, wastewater injection, mine explosions and damaged rock zones around excavations. The gas transport results are relevant to other applications, such as radon and methane migration, soil vapor extraction for cleanup of contaminated sites and landfill gas migration.